Oxford, UK – 11 March 2014. Oxford Gene Technology (OGT), The Molecular Genetics Company, has expanded its range of research-validated CytoSure Molecular Arrays to investigate DNA copy number variation (CNV) underlying a variety of genetic disorders. Designed and optimised in collaboration with experts at Emory Genetics Laboratory (EGL; Atlanta, USA), the arrays are the ideal complement to DNA sequencing, providing a particularly powerful tool for investigating the variety of aberrations underlying genetic disorders. Professor Madhuri Hegde, Professor of Human Genetics at Emory University School of Medicine, will discuss the design and application of these arrays at the American College of Medical Genetics (ACMG) meeting on Thursday 27 March 2014. Comparative genomic hybridisation arrays (aCGH) are the gold-standard for CNV detection and the 60-mer oligonucleotide probes utilised by OGT’s aCGH platform have been shown to deliver superior CNV detection than alternative platforms. The expanded CytoSure Molecular Array portfolio now enables detection of CNV in genes associated with over 20 genetic disorders, including cardiovascular, inherited eye, intellectual disability and neuromuscular disorders, as well as a range of inherited cancers. In addition, genes covering each disorder can be combined to create bespoke custom arrays, or further customised by the addition of novel content to suit each individual research project. Utilising highly targeted, exon-focussed arrays has been shown to detect CNVs as small as 12 bp in size that were missed by targeted NGS.1 Whether used alone or alongside sequencing, CytoSure Molecular Arrays allow researchers to reliably investigate the role of CNV in a wide range of genetic disorders. Register for OGT’s ACMG workshop to hear Professor Madhuri Hegde discuss the design and implementation of CytoSure Molecular Arrays at Emory Genetics Laboratory. 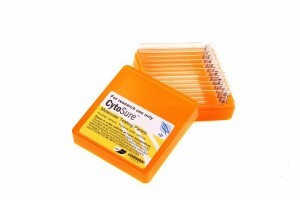 For more information on CytoSure Molecular Arrays, visit www.ogt.com/cytosure.